Spices often spill out secrets that have got lost over a period of time. Fall in love with Masalas. Make your own Masalas to make every meal more interesting. Masalas are as outstanding today as they were hundreds of years ago. 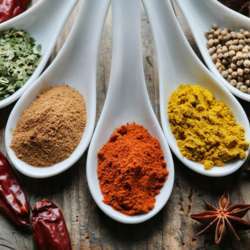 A masala is a blend of various spices used in Indian cooking. It could be wet or dry and a range of attractive colours. The quality of home cooked food is automatically enhanced with home made masalas. Let the aroma of freshly ground spices lure you into the kitchen to cook up a storm. Making your own masalas can be very satisfying and knowing how to combine them right is an art. Diverse and delicious, Indian food is among the leading cuisines of the world. Masalas used in the Indian kitchen to add unique flavours to the dish. 11:15 am: Blending of Masalas and bottling . 12:00 pm: Sampling of Curry and Chai and question answer time. Enjoyed by millions in India, Masala Chai, a spiced, sweetened black tea mixed with milk, is now popular around the world. Vindaloo Masala Powder -An easy recipe, made fresh at home with ingredients that you already have in your kitchen! Freshly ground masala paste will make your food doubly delicious. If there is time, we may even cook a curry and enjoy a cup of Spiced Tea.